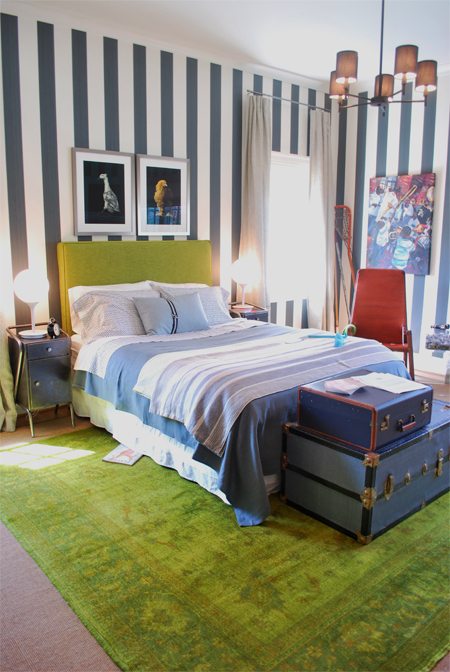 The teenage boy bedroom by Regan Billingsley Interiors was one of my favs at the DC Design House. Yesterday, I had the pleasure of attending the DC Design House Press Day and it was absolutely fabulous. Beginning in 2008, the DC Design House is "a unique design show house event for the DC Metro area in which top area designers showcased their talents into a “flowing design home” to raise funds for a local charity." Over the past three years they have had over 20,000 visitors and raised more than $400,000 for the Childrenʼs National Medical Center. This year was my first time going and it was such a wonderful experience! I was able to meet with each of the interior designers responsible for the 25 gorgeously-designed rooms in the spectacular house. It was fascinating to chat with them on the thought and creative process behind their rooms. And as if that wasn't enough, I was able to meet (in person) with fellow local bloggers that I had connected with from the blogosphere. I took tons of photos and can't wait to share them with you! I would've had them up today, but between my allergies and Cora's teething/unusually fussy behavior, it'll have to wait until tomorrow. So come back and I promise you won't be disappointed! Beautiful room! And I how fun that you got to attend! and I know about fussy and teething. We are right there too! Isn't it?? The photo doesn't do it justice, I'm afraid ;) more photos coming tomorrow :) Teething is the worst. I feel so bad for her because I can imagine what it must feel like. And it comes on so randomly too. Really catches us all off guard :) hope your little one feels better soon! !